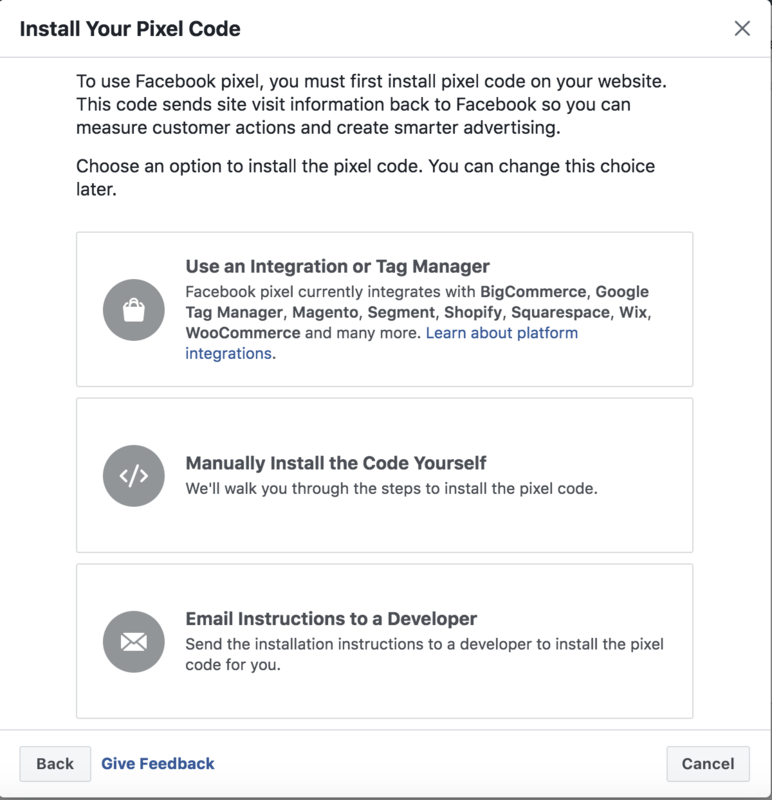 The Facebook Pixel and Pixel Events go hand in hand - you need both to get the most value from your Pixel Installation. An Event is defined as an action that happens on your website (like when someone makes a purchase). Standard Events: are 9 actions Facebook recognizes and supports across ad products. For example, you can leverage standard events in catalog sales ads and Facebook pixel website click ads. Custom Events: are actions that fall outside those covered by Facebook standard events. You can create and use them when you want to track something non-standard. In order to track an event, you'll need to place an additional piece of code on your website to help Facebook understand that someone has taken an action. These instructions were taken directly from Facebook's Success Center, but supplemented with more detail. Go to the Pixels tab in Events Manager and click Set Up Pixel. After naming your Pixel, Click Manually Install the Code Yourself and click "Continue." Click Install Events, then click the toggle next to the event that you want to track. Click the toggle icon next to an event you'd like to track. Once your Pixel is set up - go back to the Events Manager. If you have more than one Pixel - be sure to select the one that you want to associate events with and click "Setup. " Then click "Manually Install the Code Yourself." When the next screen generates skip over step one, because you already have the Pixel installed, and click "2" above "Add Your Events." This will bring you back to the pop-up screen that was originally shown during Pixel setup. Then click the toggle icon on the events that you want the Pixel to track. 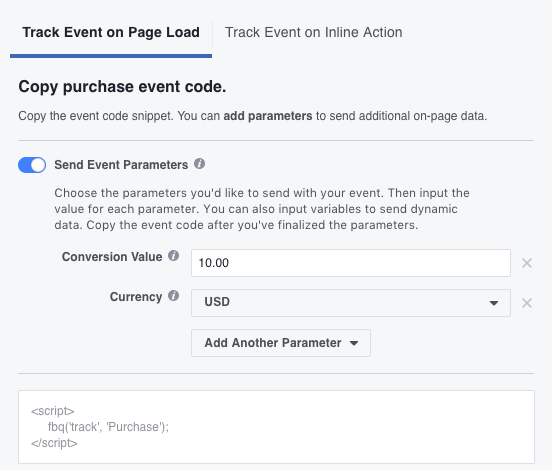 With all Standard Events that Facebook offers - they give you a choice to track an event on Page Load or Inline Action. Add event parameters, like Conversion Value or Currency, to measure additional information about your event. Now that you've set up what events you want to track and when the events are triggered - make sure that the Facebook Pixel can actually track them. Copy the generated event code and paste it on the relevant page of your site. Be sure not to modify the pixel code you've already placed in the header of your website. If you'd like your Facebook pixel to fire on specific button clicks, you'll have to update the code to tie an event to an action. 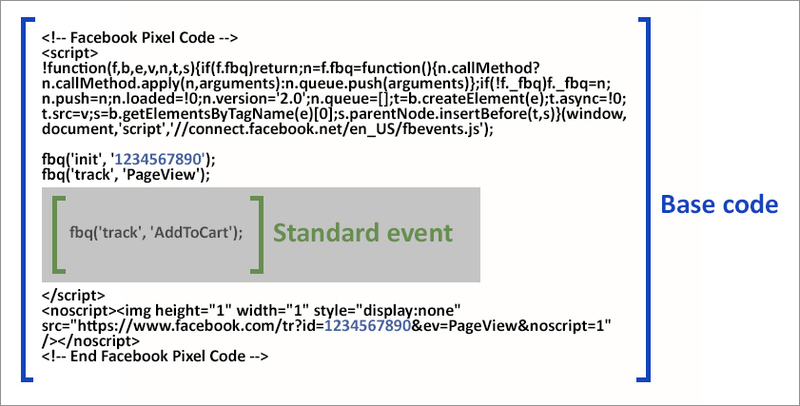 Learn more on Facebook's developers site, under the Track In-Page Events section. Unlike the events featured above, custom events can't be used for tracking and optimization without additional action. If you've implemented the base code across your website but not standard events, you can leave the code as is and create custom conversions using URL rules instead. To set up a Custom Conversion using URL rules go to the Events Manager Page, click on the Custom Conversions tab, and then "Create Custom Conversion." After you've input a URL, named your custom conversion - select a category from the dropdown and click Next. Optionally - you can also add a conversion value to your custom event. For example, if you're selling tickets worth $10 USD, then you'll type in "10" for this value. Note that conversion values need to be whole numbers and can't include any additional characters, such as a dollar sign. Including a conversion value allows you to view your return on ad spend in your reports. After you've completed your settings defining your custom event. Click Create and Done. Select your custom conversion to optimize for, and track, that conversion. We highly recommend downloading the Facebook Pixel Helper to see if your Pixel is working correctly. It's a Chrome plugin you can use to see if there's a Facebook pixel installed on a website, check for errors, and understand the data that's coming from a pixel. Download the Facebook Pixel Helper here. If you see a notification that no pixels were found on your site or that there's an error, then check out Facebook's Pixel Troubleshooting Resource.